Former world number one Tiger Woods has confirmed he will miss this month's Open Championship at Sandwich because of his troublesome left leg injury. The 35-year-old has not played competitively since suffering a recurrence of the injury at the . "Unfortunately, I've been advised that I should not play in the British Open," Woods said on his official website. Woods has 14 major titles, four short of the record held by Jack Nicklaus. Despite slipping to 17th in the current world rankings, Woods insisted: "I think my best years are still ahead of me and I'm very confident and optimistic about the future. "I am only going to come back when I'm 100% ready. I do not want to risk further injury. "In hindsight, I probably shouldn't have competed at the Players, but it's a big event and I wanted to be there to support the tour. I've got to learn from what I did there and do it right this time and not come back until I'm ready." Peter Dawson, chief executive of the Royal and Ancient Golf Club which organises the Open Championship, said: "I know how disappointed Tiger is not to be able to play in the Open this year. "Naturally, we are sorry that a player of his calibre isn't able to join us at Royal St George's, but we wish him well in his recovery and hope to see him back soon, competing in front of the fans that love to see him play the game." Woods, who was also recently has been plagued by injury problems for much of the last three years. Following his memorable US Open win in 2008, his most recent major title, Woods revealed he had a double stress fracture in his left tibia and also added that he had been playing for almost a year with a torn ligament in his left knee. He subsequently had surgery and missed the next eight months, including that year's Open and PGA Championships. Woods took five months away from golf in 2009-10 after his much-publicised marital problems but returned for the 2010 Masters. He had Achilles trouble in late 2010 before suffering a sprained left knee and a mild strain to his left Achilles tendon after hitting out of the pine straw . Although he returned for the Players Championship at Sawgrass, Woods - who has not won a tournament since the Australian Masters in November 2009 - played only nine holes and dropped six strokes in the process before he . Former European Tour player Jay Townsend is concerned about Woods's future. 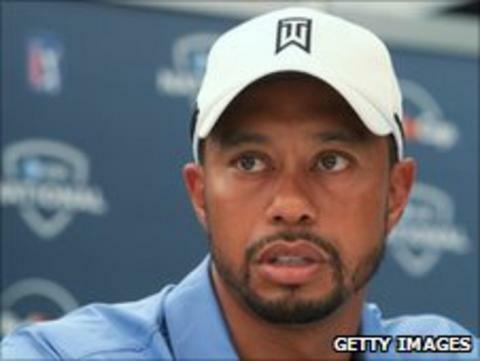 Townsend told BBC Radio 5 live: "I think Woods is living in denial. At 35-years-old he has had four surgeries on his left knee and he has a chronic Achilles problem. How can his best days be ahead of him?" Irishman Padraig Harrington, who won the last two majors of 2008 while the former world number one was sidelined, described the news of the American's latest absence as "unfortunate for the game of golf and more unfortunate for him." "He still is the name we would look out for the most. It's not that we want him to turn up and win, but it would be nice to have him there and bring the buzz he does," Harrington continued. "It's a good feeling when you go down the stretch with Tiger and it's a great feeling when you beat him. "He certainly pushed everybody else along. I'm looking forward to him getting back and disappointed he's not there." Australian Brendan Jones was first on the reserve list to replace Woods but he declined the invitation so American Jason Dufner will fill the vacancy at Sandwich.